Basseterre, St. Kitts-The leeward Island Hurricanes was triumphant over Guyana Jaguars in a 4-day game that was decided in final hour of the game played at Warner Park from November 18- 21. After winning the toss on Friday the Guyanese won the toss and elected to bat first. The two openers Rajendra Chandrika and Shimron Hetmyer got their side off to a quick start in the first hour with the latter stoking a fast half century off just 79 deliveries to fuel an opening stand of 84 before he was undone by Rahkeem Cornwall for 53. Replacing Hetmyer was Guyanese captain Leon Johnson who only lasted all of three balls when he became Cornwall’s second victim. Just before the luncheon interval they also lost a third when Vishaul Singh was bowled by the leg spin of Hayden Walsh Jr to restrict them to 103-3 at lunch. Following the interval the partnership of Chandrika and former West Indies batsmen seemed unbreakable as both piled on the runs. However they were dealt a blow when Chandrika had to retired hurt on 64 after feeling ill.
His replacement Christopher Barnwell did had much of an impact and departed the last ball before the tea break caught behind of the bowling of captain Kieran Powell. Following the tea break as wickets continue to fall regularly Chanderpaul looked in ominous form as he brought up his 135th first class half century. Despite his heroics wickets on the other end continue to fall as Cornwall ran through the other Guyanese batsmen picking up six wickets for 87 runs leaving the away side 293 all out. Chanderpaul was left unbeaten on 81. The Leeward Island opening pair of Montcin Hodge and Kieran Powell had to survive a difficult period late Friday afternoon and did so quite effortlessly. On Day two the Leeward Islands lost Hodge early and brought Akeem Saunders to the crease who got off the mark with a boundary but was dismissed soon after misjudging the bounce of a delivery from Barrnwell for 7. His dismissal sparked a string of quick wickets that quickly saw the home team 69-4. Despite the fall of wickets Powell seemed set for a big score as he past 50 but he kept running out of partners as his team crumbled 109-6. He however showed his class stroking five 4s and a six as he looked certain to reach a century but fell to a soft dismissal for 79. His team then struggled to 158 all out falling 135 short of the Guyanese total. In their second innings the Jaguars looking to build quick runs on their 135 run lead lost their top order early and was reeling on 109-6. A quick 86 run partnership between Barrnwell and Raymon Riefer steadied the Guyana ship as the lead swelled beyond 300. When Reifer and Barnwell departed the Guyanese declared the innings on 233-8 setting the Leewards a target of 369 for victory. The opening pair found themselves in another tricky position having to see out a late afternoon spell and both successfully did so. On the final day the home team were sitting comfortably on 47-0 needing an additional 322 for victory looked to be going after the total as Powell regularly found the boundary and brought up his second fifty of the game but shortly after smacking Verasammy Permaul for a six was undone a few balls after by the same bowler as he miscue his shot to a fielder on the boundary. The Leewards then lost Saunders shortly after to be 109-2 with a chance still of chasing the total. Hodge then reached his half century and he along with Chesney Hughes inched Leewards towards the target. When Hughes departed for 22 shortly after lunch the chances of a Leewards victory started to fade. As Hodge continue to fight Nkrumer Bonner who replaced Hughes stated scoring freely, turning over the strike regularly and getting the occasional boundary. With the partnership growing between Hodge and Bonner with Hodge inching towards a century and the target getting smaller the Guyanese bowlers employed a defensive tactics to try and slow the Leewards scoring rate. At tea the Leewards needed 133 runs in the final session to grab their first win of the 2016-2017 season. Shortly after the break Hodge and Bonner both celebrated personal milestones with the former recording his second first class century and the latter pass 50. They both looked then ganged the tempo of their scoring with time running out but were set back when Hodge departed for 114. However Bonner continued the charge with Hamilton with another 60 runs needed in the final hour. The game took another twist when Bonner departed for 82 and Cornwall was run out without scoring. The small but anxious crowd became boisterous as Jerimiah Louis and Hamilton looked to bring the ship to shore. They cheered every run and scolded the batsmen when they thought they played a bad shot. But Hamilton and Louis looked comfortable for the most part. When Louis struck Reifer for huge six over long on the anxiety levels dropped and it looked certain that home side would get victory with 25 needed off the final 10 overs. 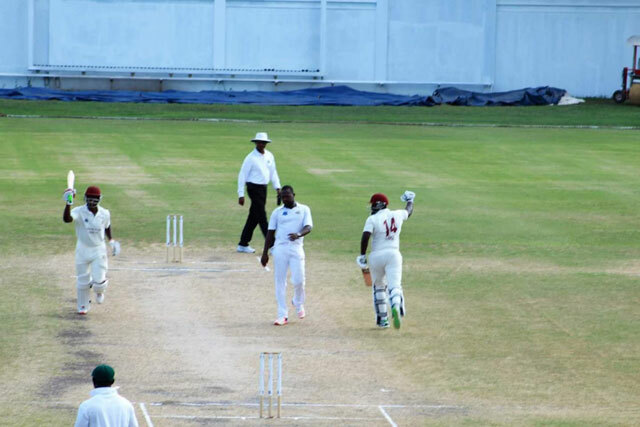 Both batsmen then chipped away at the runs and with three needed Hamilton ended the game in style with a six straight back over the bowlers head to record a four wicket win for the Leewards and complete the highest fourth innings chase in the modern era of West Indies first class cricket. The Leeward Islands will be in Trinidad this weekend to face that country in a 4-day encounter at the Queens Park Oval.